﻿ Even outside of the Britrock boom of the early- to mid-2010s, the most melodic of melodic rock bands are still finding ways to crawl out of the woodwork in a bid for success. It’s becomes something of a hassle to find anything new to say about them; most of the time each one, apart from the very smallest details, prove to be just as ambitious and just as ultimately bland as the last. 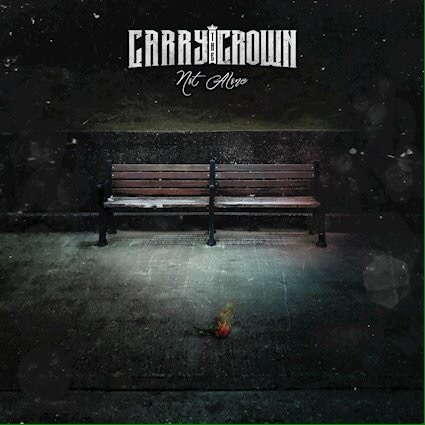 So here’s Carry The Crown, yet another band operating in the mould of Young Guns and Mallory Knox, with a new EP that sets out to achieve exactly what both their influences and contemporaries did in their early days. And it’s hard not to view Not Alone away from those very specific parameters, especially with tracks like Fire and Eyes that try for a similar harder edge that really struggles to impress nowadays. However, Not Alone does prove to be a bit more likable thanks to a clear pop-rock streak that adds in some snappiness and levity that works to their benefit. It’s especially present on Hold Me, which should be the token, sappy acoustic number, but with some extra guitar layers with a bit more bounce and Martin James’ surprisingly clear, light vocals, it’s proof that Carry The Crown operate much better as a pop-rock band. It gives them a bit more leeway for some fairly uninspired lyrical choices, and when transferred to a plugged-in setting on Hometown, the dots begin to join together for what could be a pop-rock band with some legs under them. To get to that point though, growth is imperative, and at the minute, Carry The Crown aren’t exactly doing much to turn heads, at lest not unlike what so many have done before them. That said, there’s appeal here that other bands of this small stature are unable to boast, and if they could concentrate what Not Alone has in spurts into something fuller, they could be a band worth backing. It’s worth a look at least, not for what’s here now, but for what could show up in the future. ‘Not Alone’ by Carry The Crown is out now on Bentley Records.